It’s true. The moisturizing lotion alone can hydrate adequately. Don’t underrate that the lotion plainly comes in liquid form as opposed to the thickening agents found in creams. The hyaluronic acid was, in fact, more emollient feeling than some of my moisturizers made for oily skin. My hands slide off my face, and the runny texture terribly feels like patting an intense serum. I arbitrarily detest super icky stuff, considering it can trigger my oily skin. My whims aside, I agree that the lotion gives doses of moisture as regard to the product’s claims. This would make a moisturizing elixir for dry skin. No doubt. Unless you live in Iceland or the Alps, I find the lotion’s moisturizing powers excessive under tropical climes. it as my AM moisturizing toner at home after cleansing. It’s very ideal to use the lotion the morning after using a light peel. 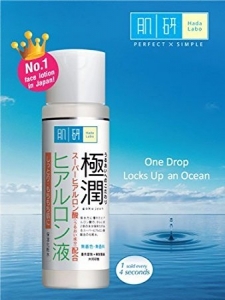 It takes away the flaking faster than my preferred oil-free moisturizer, and that’s another testament to Hada Labo’s superb ability to hydrate the skin. I couldn’t brave the prospect of wearing it together with makeup though. Given the specific process of application involved (which I’ll explain later on), I love that it affords me some time to prep my skin in the morning. My skin gets better oil control inside my room, where airconditioning is around, than in normal room temperature. Since I use this mostly at home, there’s no point complaining that my skin gets oily, as always, by the end of the day. it correctly is when my palm begin to stick (yeah, this lotion is not afraid of moisturizer stereotypes such as stickiness) to my face. My face really tugs as I pat along. This routine has improved the texture of my skin to a slight degree. No more dry spells along the hair line, and it helps me shed the dry skin easily after my Mario Badescu drying mask. What remains later is baby-soft, elastic skin. I’d like to think too that treating my skin to a stimulating massage at AM helps me ward off wrinkles. Hyaluronic acid is truly great for the skin. I paid twice its retail price (14 dollars), because it’s not sold in my location. Folks, I super recommend this hydrating lotion. Go ahead and start patting.